Okay, there are a few things that are happening that are kind of a big deal for someone who is all kinds of fangirl. First thing first. Let’s talk movies. A few days ago (or was it just yesterday?) the teaser trailer for Beauty and the Beast live action was released. And I know you probably all have seen it–what, with the advent of the internet and everything–but I’m going to add it here. Because I want to. Because it’s such a tease. Because I can. And seriously? How can that not get you excited? I know it’s almost nothing. I mean, you see a door open, you hear voices, and then it’s pretty much over, but then you realize you’re pumped about it because it’s almost here and you’re trying not to get too excited because you have just under a year to wait but you’re excited anyway! << Yeah, all that. I’m so curious how this will play out. Will it stick pretty close to the animated storyline? If it ventures a bit, how far will it venture? Will I like it? How can I not like it? << Yeah, that too. We have Bill Condon as director. I liked The Twilight Saga: Breaking Dawn 1 & 2 so that’s a good sign. And Evan Spiliotoupolis and Stephen Chobsky have also done great work, also a good sign. And we have a pretty darned good cast of characters as well so . . . all signs point to a really good movie. Fingers crossed that it will live up to the hype, the expectation, the everything! Beauty and the Beast was my favorite Disney animation (despite the fact my twelve-year-old self couldn’t quite wrap my head around the timeline between when the Prince became a Beast and to the arrival of Belle. Seriously, I just coughed it up to magic and let it be) so I’m pretty excited about it. Then there’s this video that pops on my Facebook feed with Ellen interviewing Lorelai (Lauren Graham) where she talks about how they’re almost done filming the last four 90-minute episodes of Gilmore Girls. And she talks about her book about the Gilmore Girls! You can watch that here. As excited as I am to hear that the release for Gilmore Girls: A Year in the Life is near. I am also a bit sad because then it’s over. I mean, really over. I know we Gilmore Girls fans didn’t quite get closure at the end of Season 7 and we really wanted it, but now it’s so much near! You know, the … That’s All Folks! Will Rory and Logan end up together (because I really hope she does. Seriously, I was a hard-core Jess fan until I met Logan. You can read all about that here and here, that is if you totally dig my blog and want to visit Stars Hallow with me). A novella to tie us over until the Arcana Chronicles, Book 4! 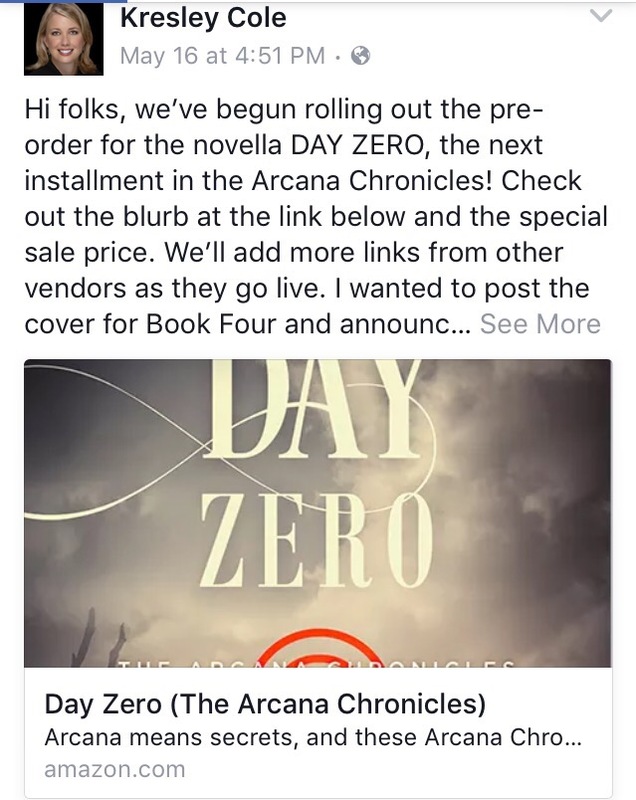 And Book 4 should be released this fall! I am in love with this series. I’m irked a bit that this is a series and can’t be wrapped up in one book, without cliffhangers, but que sera sera. And while it is a series–because, you know, I can’t change that and I’m okay with that (because props to you Ms. Cole, you are doing an excellent job! )–I’m in for the ride. So, I am so stoked. Super stoked. Talk about all kinds of fangirling! I did my fair share of squeezing, let me tell you. It’s big news. Big news! And it’s going to be a long wait to the fall for two out of three on this list. I can live with that until Beauty and the Beast is released. Of course, there are much more fangirl moments spanning books, television, and movies, but these three hit in a course of eight days so … squee! It’s going to be quite the year.